Product prices in the field of cardiology are on a steady decline over the years, and especially for the leading products used in such procedures: drug coated stents (DES, drug eluting stents) intended for releasing the medication at a determined dosage in order to keep the artery open for a longer time. The first DES that has broken its way into medicine was for the first time distributed in Israel by the JNJ company in 2002, when Cordis had presented the Cypher. Its marketing started at a price of about $ 2,700, and since then the price has declined by 25% every year. Currently numerous DES are marketed by many manufacturers, and the prices have achieved just about $ 300. The products in this field are dynamic and subject to frequent changes of different models and versions. The stents marketed today are based on some kind of metal. While they help to achieve significant benefit in the course of many years in 70% – 80% of patients, about 20% – 30% of patients still need of repeated implantation half a year later at the same site where the stent has been implanted due to restenosis developed inside the stent. In order to solve this problem, drug eluting stents have been developed over a decade ago, intended for preventing the proliferation of cells and for inhibiting the process of restenosis. They are based on various technologies by means of which the medication is attached to the implant and is released from it. Some of them are made of metal combined with polymer – a plastic material connecting the stent’s metal body to the drug and intended to cause a slow and controlled release of the drug within a month. Another implant is coated with polymer that within a month is absorbed on its own, and along with its absorption the drug is also released. Two technological innovations in this field are a stent with a distinctive structure that allows it to attach the drug to the metal without the need for an intermediary polymer, and a biodegradable stent made entirely of a polymer that is absorbed by the body and is entirely gone away in a matter of time. The first technology is particularly suitable for patients with diabetes, since the polymer itself may initiate in them a local inflammatory reaction and start the development of a process that eventually will cause restenosis inside the stent. An example of such a stent is the Cre8 stent marketed in Israel by Gamida Company and included in the “basket of medicines”. There are concavities inside the stent walls, from which the drug is released into the artery wall. Likewise, the BIOFREEDOM stent, marketed by Ami Technologies, is also intended for patients at high risk of bleeding and is the only one approved by the European CE Mark for transplantation with the anticoagulant treatment for one month only. 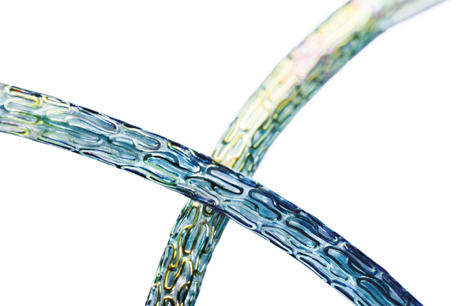 An example of biodegradable stent is the Absorb by Abbot – the only biodegradable stent that is completely biodegradable and the first one developed in the world. This stent, which has recently been launched in Israel, is made of a naturally melting polymer that is widely used in medical implants, such as soluble sutures. More examples of stents with biodegradable polymer include the ORSIRO by Biotronik with the thinnest, so far, case diameter (60 microns) and the SYNERGY Stent by Boston Scientific. Examples of stents with non-biodegradable polymer include the XIENCE XPEDITION by Abbot – a “veteran” stent with the most accumulated years of research – and the ONYX stent by Medtronic that has a flexible structure. Like the metallic stent, a biodegradable stent serves as a “scaffold” that keeps the blood vessel open, but dissolves within six months to a year. The idea behind this development is actually for the stent to keep the artery open for a critical period of just several months during which the artery tends to close. This period is the time required for the artery’s natural recovery, while later on it will remain open even without a stent. It certainly is an interesting and advantageous innovation. For example, if the need later arises of a bypass surgery, it would be easier to deal with an artery without the interference of a permanent implant. However, in the years to come it would be necessary to examine their long-term results. For more details please contact Sofi Rubin, Advanced Medical Equipment Department manager, at 09-8922069.